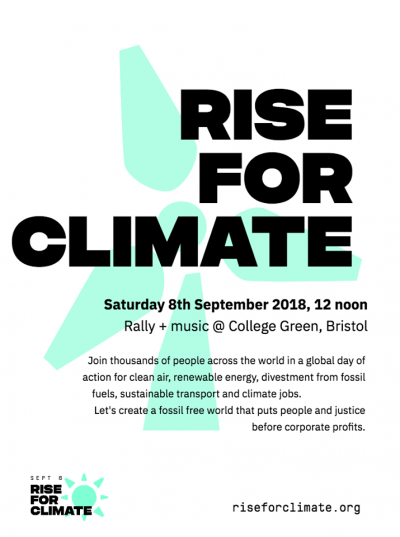 Bristol Cycling is supporting the Bristol Rise for Climate rally on Saturday. It’s one of hundreds of events in over 80 countries around the world. We hope there will be lots of folk there with bicycles, one of our most powerful tools to tackle climate change. Grassroots environmental groups under the umbrella of Bristol Environmental Activists Together are assembling on College Green to call for upon our elected leaders for urgent action on climate change. “No more stalling, no more delays: it’s time for a fast and fair transition to 100% renewable energy for all.” Speakers include Bristol Health Partners, who are very strong on the 20 mph speed limit, and Zoe Banks-Gross on clean air. All are invited to attend, either in a group or as a concerned individual.